With reports that two thirds of road deaths have occurred on regional roads, the Australian Road Safety Foundation (ARSF) will next week launch a new rural road safety initiative. Joining forces with Deputy Prime Minister Michael McCormack, Mayor Bob Kirk, representatives of NSW Police and long-time ARSF sponsor, Suncorp, the community-based initiative is calling on everyday road users to jump in the driver seat of rural road safety. Despite making up only 16.5 per cent of the nation’s population, regional road deaths account for a staggering two in every three of the national toll. To address this disparity, the ARSF commissioned new research, which revealed that both regional and metro drivers change their driving behaviour when on rural roads. In fact, according to the data, 1 in 3 Australians are more likely to break a road rule when driving on rural roads, compared to city or suburban streets. Russell White, CEO and founder of ARSF urged Australians – both regional and city based – to take ownership for their role in reducing the rural road toll. “While there are a number of factors that contribute to the regional road toll, it’s every day Australians that hold the key to safer roads” Mr White said. “The research has told us that the main reason drivers are taking more risks on rural roads is because they’re less likely to get caught,” he said. The ARSF research also highlighted key differences in attitudes and behaviours between rural and city drivers. According to the data, regional drivers were more likely to engage in dangerous behaviour including driving under the influence of drugs, driving fatigued, not wearing a seatbelt and speeding. In fact, when it came to committing key road safety risks – metro drivers only scored worse than their country counterparts when it came to driving distracted. However, the research also showed that it was regional drivers who also recognised that a shift in attitudes and behaviours would have the biggest impact on the road toll. 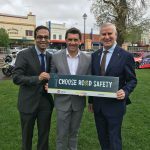 “Acknowledging that every day road users have personal responsibility is the first step, and now it’s our hope that Rural Road Safety Week will help turn this sentiment into real action,” he said. Suncorp’s Executive Manager for NSW CTP Surayez Rahman said Suncorp has a long history of advocating for road safety and getting behind initiatives which positively impact local communities. “As part of our commitment to safer roads, Suncorp is encouraging all drivers to take a pledge to drive safely in support of the new Rural Road Safety Week initiative, not just throughout the week but well after the campaign finishes,” Mr Rahman said. Rural Road Safety Week is a new national awareness campaign targeting regional and rural road safety, in 2018 it runs 8-12 October. Businesses, community groups and individuals are encouraged to get involved by hosting a local awareness raising event. To find out how to get involved visit https://arsf.com.au for more information. The ARSF research was conducted by a third-party research company, Pure Profile, and was an online survey of more than 1,000 licenced Australians, nationally representative by gender, age and location. The Australian Road Safety Foundation is a not for profit organisation dedicated to improving road safety awareness, enhancing driver education and reducing the impact of road trauma. The Foundation strives to improve road safety outcomes, develop research and educations programs and work to inform policy makers on methods to address road safety issues. It also provides an umbrella organisation for other road safety programs and community groups. ARSF is helping to develop a sustainable strategy for reducing the social and economic costs of road crashes, as well as providing a platform for future research and advocacy programs.